Sand casting is one of the oldest and most understood casting processes. It is a very good forming process for lower temperature metals, such as aluminum, magnesium, and copper-based alloys, and is especially suited for manufacturing large parts. The mold is typically made of sand and sand cores. The casted (alloy) material is usually aluminum, steel and cast iron. 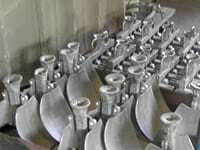 We offer ductile iron, gray iron, steel and 356 aluminum castings. Floor molding, Jolt squeezer, Disa-A-Matic lines, and resin sands are also available. We've listed a useful table of cast iron standards for various countries.